Marinade breast fillets with Red Kelly’s Sweet Chilli & Lime Dressing. Leave covered in fridge for 30 minutes. Pre-heat oven to 180 degrees and line a baking tray with baking paper (or alternatively, use a grill basket). Heat up a grill pan over medium-high heat whilst you season breast fillets with salt and pepper, and spray it with olive oil. Cook chicken on both sides for 2 minutes each or until golden. Remove from the grill pan and place them on baking tray with vegetables (seasoned with salt and pepper and sprayed with olive oil). Bake chicken and vegetables for 10 minutes. Remove chicken and test with a fork. Leave it to stand for another 10 minutes. Leave vegetables to bake for another 10 minutes or until tender (not soft). Once vegetables are cooked, toss them through the couscous and spoon onto serving plates. Slice the chicken and place on top of couscous. 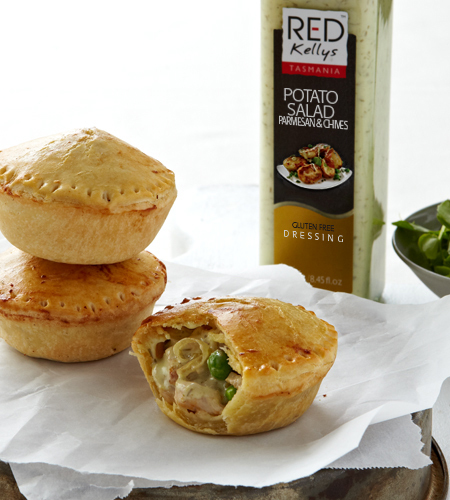 Drizzle with more Red Kellys Sweet Chilli & Lime dressing if desired. Enjoy! More roast vegetables ideas are eggplant, parsnip, zucchini, asparagus or mushrooms. The proportion for cooking couscous is generally 1:1 (1 cup liquid to 1 cup dry couscous). Less water makes drier couscous suitable for salads and serving with sauces. More water makes the couscous softer and slightly stickier. 1 cup dry couscous makes about 4 cups cooked. 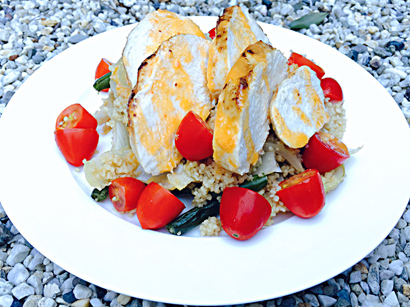 For another healthy option, couscous can be replaced with quinoa. To add some zest to this dish, simply squeeze some lime juice before serving. Any leftovers can be refrigerated for a salad the next meal.